Have any vinegar in your cabinets? Did you know it's great to help cook a better boiled egg? How about bleach, or WD-40? Read on the get some new cleaning tips & tricks using everyday household items in brand new ways! Get That Stuck Ring Off: A short burst of WD-40 will get the ring to slide right off. Remember to wash your hands after spraying them with WD-40. Kill & Repel Bugs: Keep a can of WD-40 handy, and when you see a roach, spray a small amount directly on it for an instant kill. To keep insects and spiders out of your home, spray WD-40 on windowsills and frames, screens, and door frames. Be careful not to inhale the fumes when you spray and do not do this at all if you have babies or small children at home. Remove Gum From Hair: Simply spray the gummed-up hair with WD-40, and the gum will comb out with ease. Make sure you are in a well-ventilated area when you spray and take care to avoid contact with the child’s eyes. Plastic Cutting Boards: mix 1 TBSP of Clorox Regular-Bleach with one gallon of water, soak prewashed cutting board 2 minutes, drain, air dry. Wooden Cutting Board: mix 3 TBSP Clorox Regular-Bleach per gallon water, pour solution over prewashed cutting board, stand 2 minutes, rinse with 1 TBSP Clorox® Regular-Bleach per gallon of water. Do not rinse or soak overnight. Cut Flowers: add 1/4 teaspoon Clorox Regular-Bleach to each quart of water used in your vase to extend the life of your freshly cut flowers. Prevent misty spots on glassware. Place a cup of white vinegar on the bottom rack of the dishwasher, run for five minutes, then run though the full cycle. 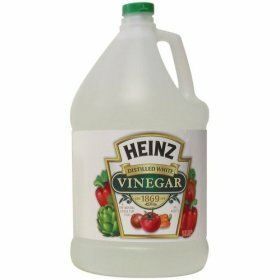 A cup of white vinegar run through the entire cycle once a month will also reduce soap scum on the inner workings. Deodorize a stale lunch box.Soak a paper napkin in vinegar and leave it inside the closed lunch box overnight. Prevent cracked hard boiled eggs. Add two tablespoons of white vinegar per quart of water before boiling to prevent the eggs from cracking. The egg shells will also peel off faster and easier.